In a world where most young people spend their time mesmerized by video games and tiny screens, it’s refreshing to discover there still exist avid readers within the generation accustomed to sensory overload at the push of a button. Even rarer is to find an author still in elementary school, but that is the case with the literary imagination behind this book. Already the author of four books, Sam Myhre, who was born in 2011, has the distinction of being the youngest published author in the United States. Centered on the theme of good versus evil, young Myhre’s story recounts the tale of Tom the Mummy who, along with his robot invention, must destroy the evil cat, Jackson. However, Jackson has the capacity also to create bots which leads to a war between the two characters. As the two characters along with their robot creations face each other to determine the fate of the world, the reader is prompted to wonder which of the two opposing forces will win the day. The author has an interest in art and science which is evident in his choice of subject matter. It’s clear he has put much thought into how he presents his characters and the story’s central conflict. Even more impressive is his collaboration with his older sister, Menna. 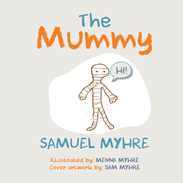 Just three years Sam’s senior, Menna’s accompanying illustrations add depth to the story, enhancing Sam’s drawings of the mummy, Jackson, and their respective robots. Both brother and sister share a love of art and reading and enjoy their work together making books. The siblings are also beginning early to establish themselves as philanthropists by donating a portion of the proceeds from the sale of this book to the support of children’s educational programs in Africa. Certainly, this a commendable undertaking for the young brother and sister team. Not only is the book a fun read, the simplicity of the storyline and its illustrations also provide a wonderful source for teachers and parents wishing to inspire young children to delve into creative writing. Children will relate to the collaborative efforts of the siblings, and after reading the book in a class setting or with a parent, they can be guided to create books of their own. Discussions of the storyline and questions concerning how the story of Tom and Jackson might have evolved will enhance the critical thinking skills of children as well as further inspire them to create their own books based on pets or people with whom they are familiar. Children can be asked to imagine the author’s motivation in his choice of the characters. They can also be led to speculate about the relationship of the author to Tom and Jackson. Whether used with children who have some reading skills or with those who have yet to learn to read, concepts such as creative thought, illustrating the narrative, and plot development can be rendered easily understood with a study of this book. This story offers a unique opportunity to reach even the pre-kindergarten child with an accessible example of the creative process by offering a head start in creative storytelling and helping to foster a love of the written word. It is a wonderful choice for instilling skills and values into the lives of children.